Capacity Building, Sustainable Land Management and Agriculture.NECOFA provides farmers with comprehensive training in sustainable ecofarming to improve food security without reliance on harmful synthetics from foreign corporations. They have a demonstration plot for training in ecofarming practices and they organize visits to various farms and community centers across the country to provide farmers with on-site training – they also organize visits to research centers, farms, and universities. In addition, NECOFA is at the forefront of reviving the country’s 4-K School Garden Club by providing tools, training and ongoing support to students and teachers. 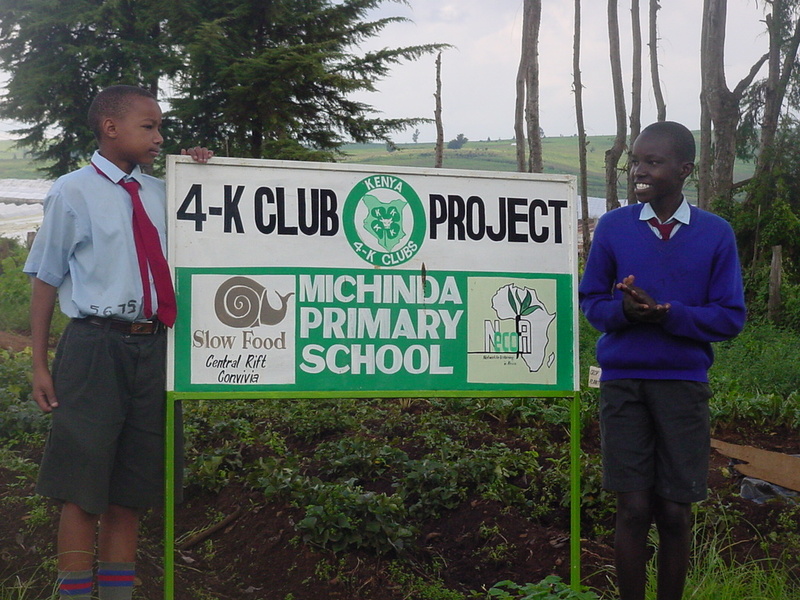 According to the Kenya Ministry of Agriculture, NECOFA is the leader in the 4-K Club revival effort and receives full Ministry support. Mitigating Food Insecurity, Boosting Nutrition. NECOFA is cultivating nutritional programs for victims of HIV/AIDS, and building the capacity for healthy and nutritional foods overall. They do this in part through seed saving, seed multiplication and education in ecofarming practices that reduce labor and increase yields. In both the high and low regions of the country, they are trying to promote indigenous foods and biodiversity, and fight against the erosion of culture. They are developing a national certification process for organic branding and sensitizing the community to vegetables that are more site-appropriate than those that were cultivated in the past. Poverty Eradication. While its concentration is on food security, NECOFA recognizes that an interconnection exists between food security and adequate housing and education. NECOFA is engaged in various income-generating projects such as the Molo Wool project, where women’s groups come together to create products out of wool from the indigenous Molo lamb. NECOFA also facilitates a revolving fund program whereby members contribute funds to a pool that they use for small loans. They also develop programs and contributions for people in extreme poverty, such as the Kokwa island refugees. Human Rights, Gender Equality: Striving to Empower Women and Provide Equity in Access to Resources and Services. NECOFA works closely with various women’s groups to empower them through income-generating projects. They also build coalitions and partnerships with multiple tribes (Kenya experienced severe tribal clashes in 1992 and 1997). Information Sharing. NECOFA organizes Food Fairs, Food Days, and exchange visits with community groups. They work with other NGOs, such asPELUM, which developed an organic agriculture network to share and exchange ideas so farmers are exposed to new sustainable technologies. They pilot the new technologies, and train the trainers who provide information to other communities. Domesticating the Slow Food Philosophy. As the coordinator of the Slow Food Central Rift, NECOFA’s Executive Director, Samuel Muhunyu, domesticates the Slow Food philosophy. He is incorporating the cultural aspects of food into his training and has grafted the principles of good, clean and fair foods and biodiversity onto all initiatives. Market Access. NECOFA is working with cooperatives to identify markets, sell their products and eliminate middle men, who sometimes cheat small farmers out of their income potential. NECOFA aims to get the highest price possible for all producers.